I started writing this on my flight home, but didn’t finish. I’m finally getting around to finishing it after all Christmas busy-ness is over. 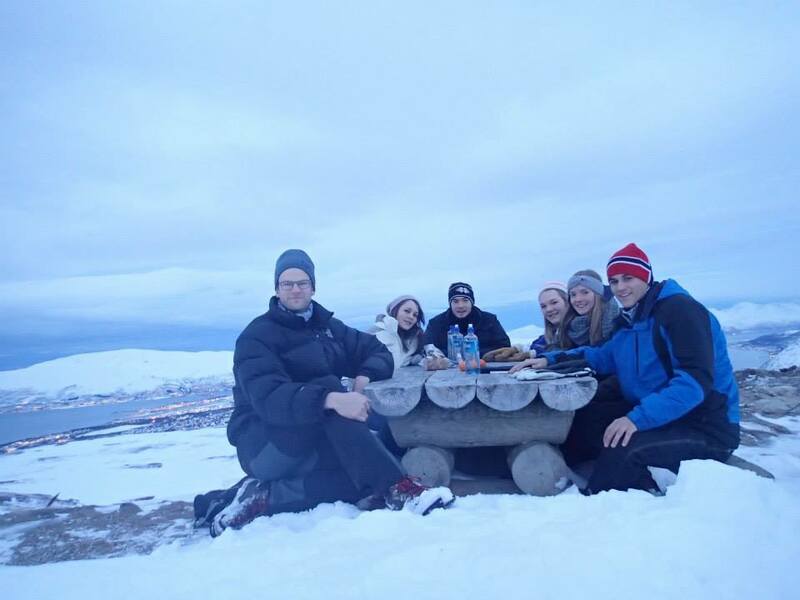 😉 This post is about my last week in Norway, which was basically my trip to Tromsø. 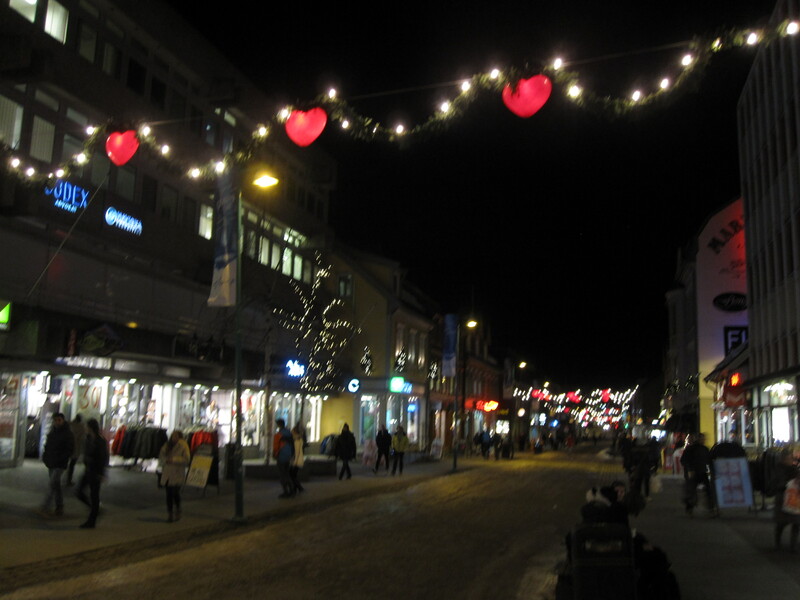 Tromsø is located 217 miles north of the Arctic Circle in Northern Norway. It’s home to the midnight sun in the short summer they have and home to the Polar Night when from November to January the sun in not visible. 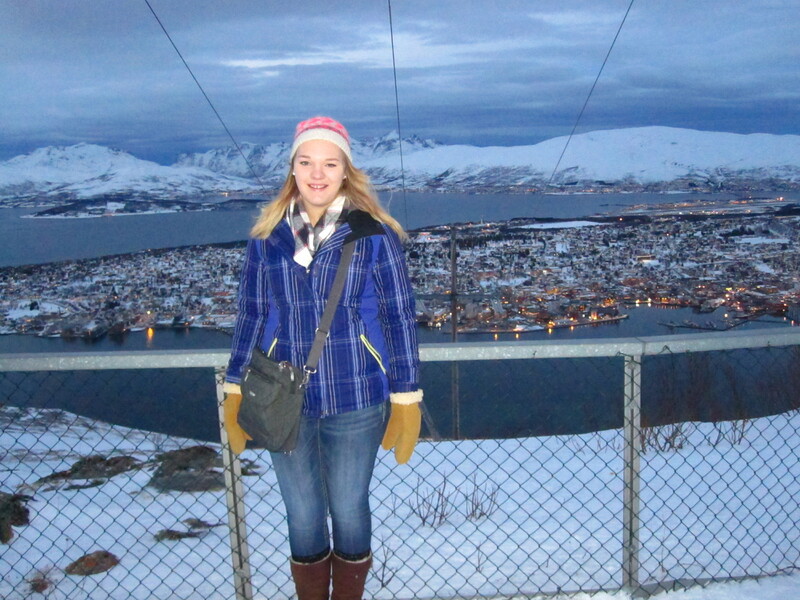 Our flight left Oslo Tuesday night at around 7:00pm and we got into to Tromsø around 9:00pm. We took the shuttle bus that runs from the airport to the city center, but the place we booked to stay, Tromso Camping, was not really in the city center. Since there was only us and one other group on the bus, the bus driver was extremely nice and said he would drop us off at the camping site, even though the bus normally does not run anywhere near there. 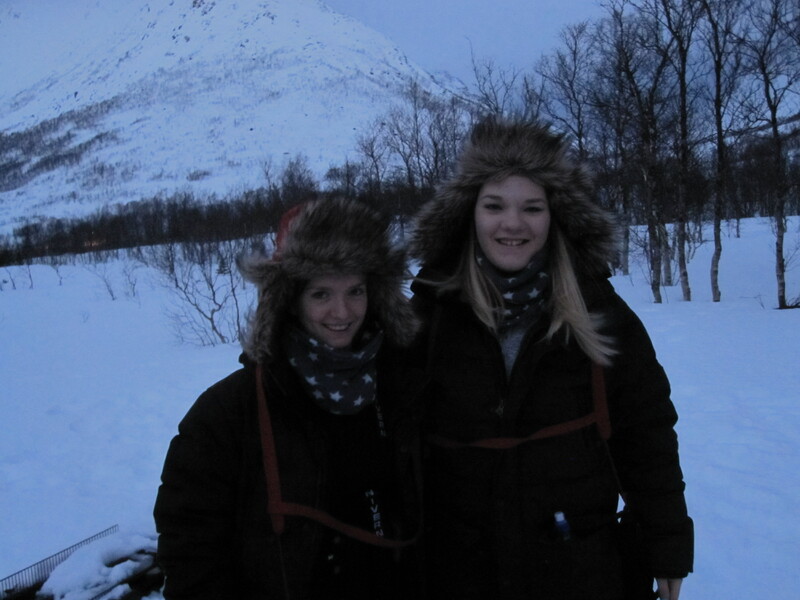 It was very nice and just another example of how nice Norwegians are and especially from Tromsø. Everyone I met there was so nice and helpful, if they spoke English. All the young people speak English well like in Oslo, but not so much the older people. That was definitely a difference to how Oslo. The use of English is a lot less up in Tromsø than in Oslo. The bus driver dropped us off at the end of the drive way to the campsite. I knew we were in the Arctic Circle, but what I did not think was the everywhere would be so icy and slippery! I cannot even begin to describe how slippery the roads and sidewalks were when we got there. They had sand/rock salt put down on some parts of road, but it almost had been frozen into the ice so it defeated the purpose of it. We made it to the cabin, which was really nice. It had a nice little kitchen area, a pullout couch, a flat screen TV, one bedroom with a full size bed, a decent bathroom and heated floors throughout the place. I was really surprise how nice the cabin was and would definitely recommend them to anyone who is planning on going to Tromsø. Wednesday morning Ira, Steve and I had booked a day of dog sledding, so we had to be up early and at the city center by 8:45am for them to pick us up. We arrived at the dog sledding location after a a half-hour or so drive. As soon as we got there, we all got changed into more suitable arctic snow gear and then got back into the van to go to where the dogs were. 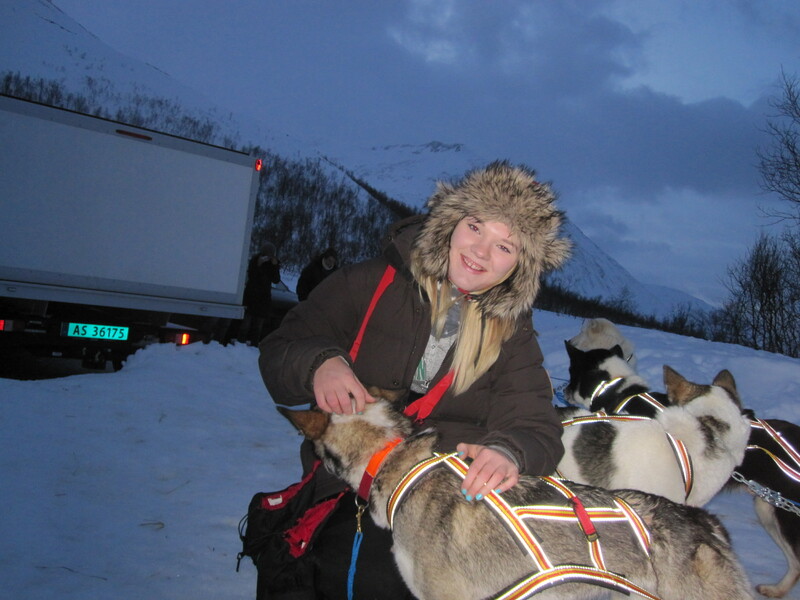 Before starting to dogsled, we had to help harness all of the dogs up. That in itself, took quite a bit of time. The dogs were a lot smaller and leaner than I expected, but very strong. They pulled you in the direction they wanted to go. Since there was an odd number in our group, I ended up being paired with the instructor, Tor. 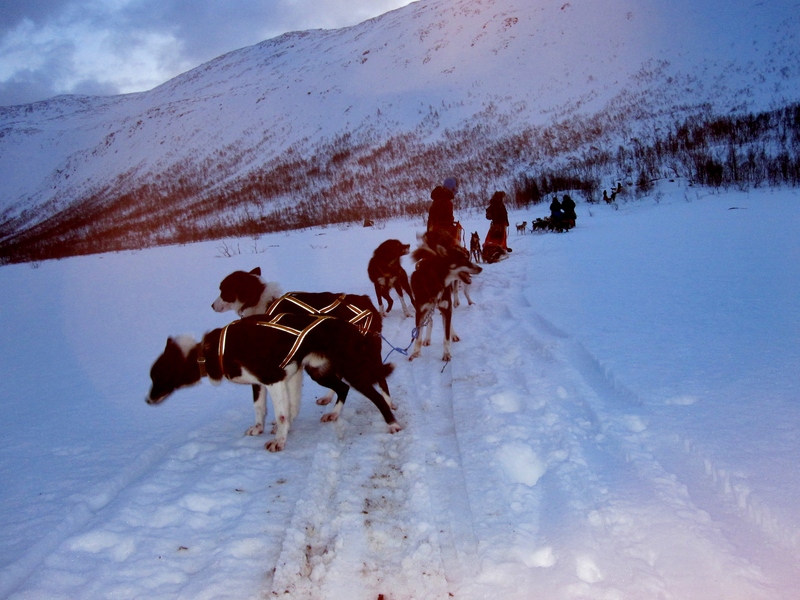 I road inside the dogsled the first half of the way. It was quite relaxing sitting in there, taking in the beauty of the surroundings. At the halfway point, we stopped and the guide let everyone know it was the halfway point and that if they wanted to switch drivers or mushers, than do it now. I thought, that since I was with the instructor I wouldn’t be able to drive and was actually okay with it, but he said he wanted me to try it. It was a little nerve wracking mushing the sled of dogs with him sitting in it, when he’s competed in the Iditarod, the worlds biggest sled dog race. He joked around and said he was going to take a nap and that I was in charge. 😉 I drove for about a half hour or so! 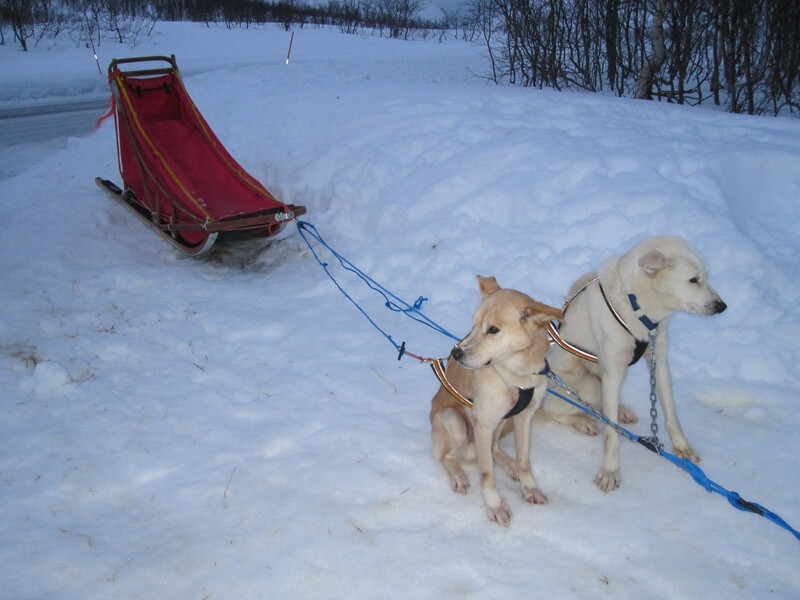 It’s a lot harder than it looks because you have to balance standing on the sled, control the speed of the dogs by using the breaks, and since I was driving the first sled I had to also every so often turn around to to make sure the other 8 sleds were still coming. After the ride, we had to unleash the dogs and put them back into the kennels and then feed them. It was definitely a once in a life time experience and I enjoyed it. 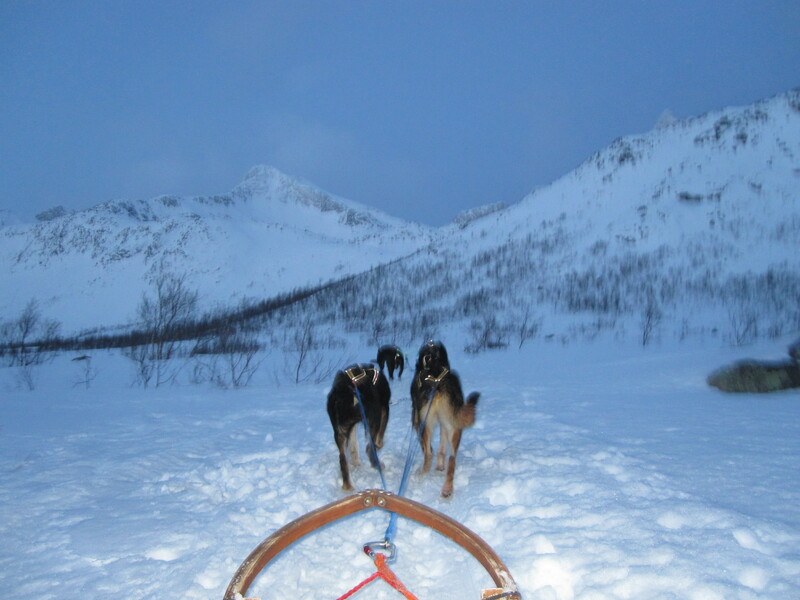 Not many can say they went dog sledding in the arctic circle in Norway. Thursday morning we got up and made breakfast. 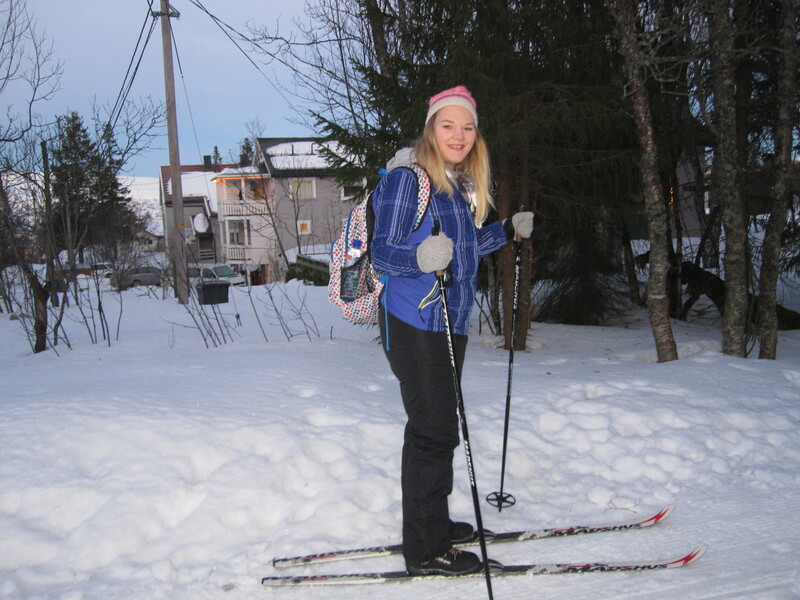 Then we headed into town to rent cross country skis. 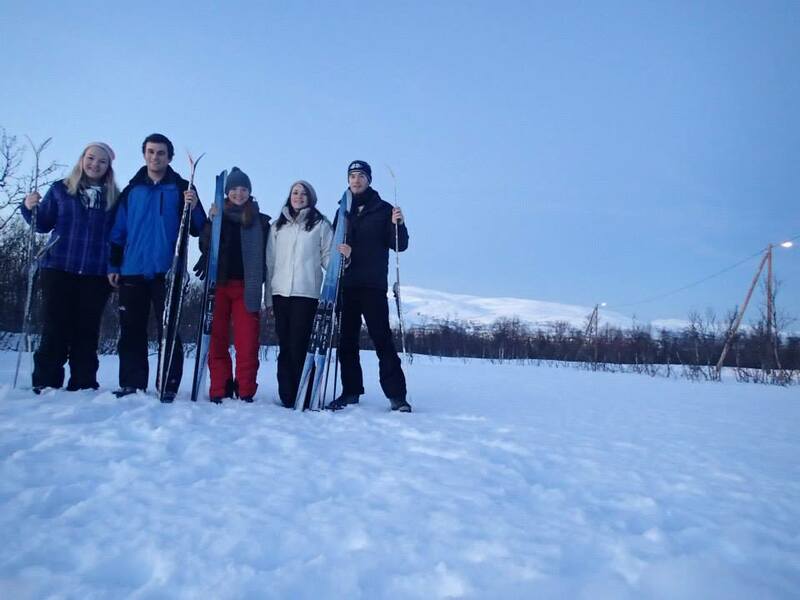 We spent the afternoon skiing through cross country trails around the city of Tromso. At first, it was super hard to get used to how to ski up the hills, but after I figured out how to do it, it was really fun. We even were able to sit up and eat our lunch atop a hill and watch both the sunrise and set during our lunch. 😉 That was kind of the running joke throughout the trip is that we could go do something outside and watch both the sunrise and sunset within the span of 2 or so hours. 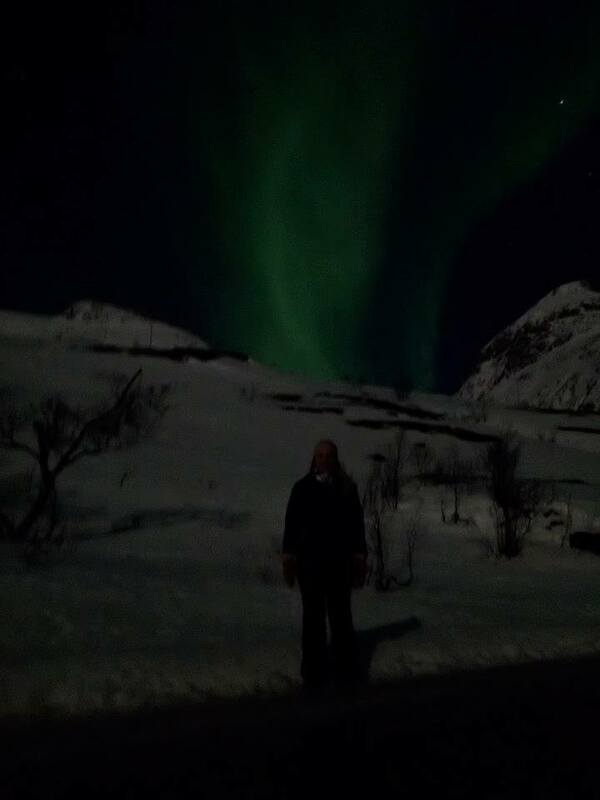 Thursday night we rented a car in hopes to drive somewhere to see the Northern Lights. 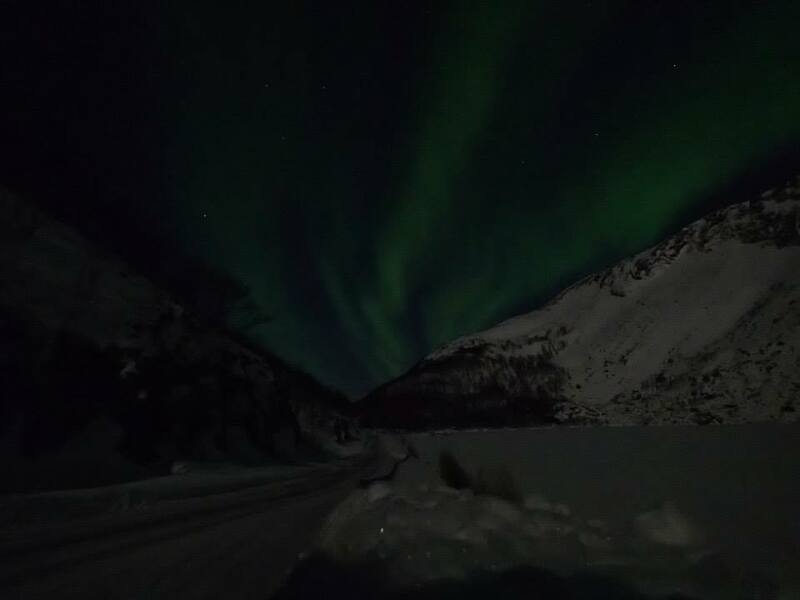 To say the least, we were very lucky and saw some amazing lights! 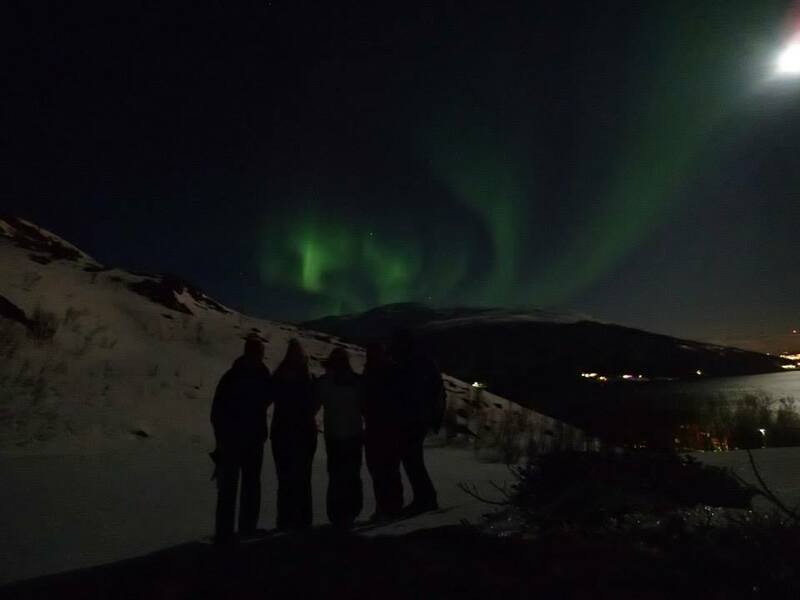 I knew 3 or 4 people who went to Tromso earlier in the semester and did not see any. That might have been the highlight of the trip. The pictures don’t really show how amazing they are. 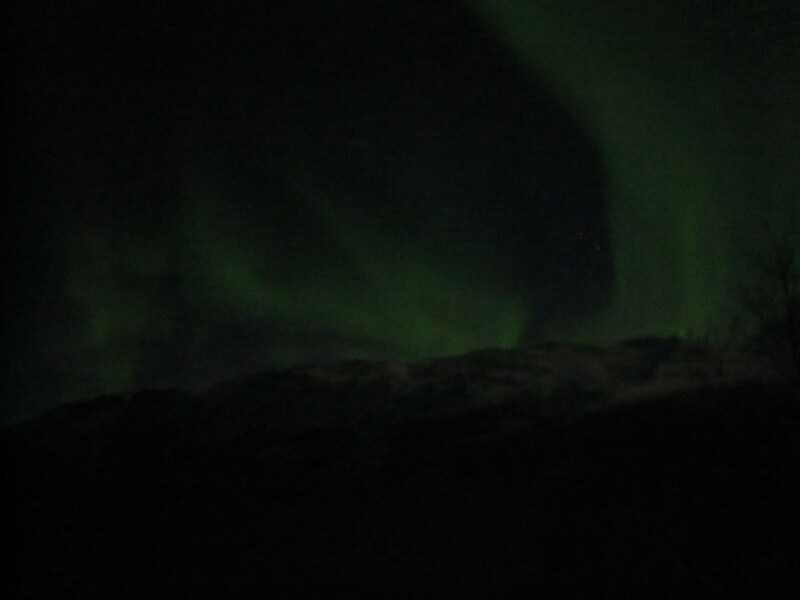 It’s almost indescribable being so far north between mountains with these amazing greenish lights dancing in the sky. 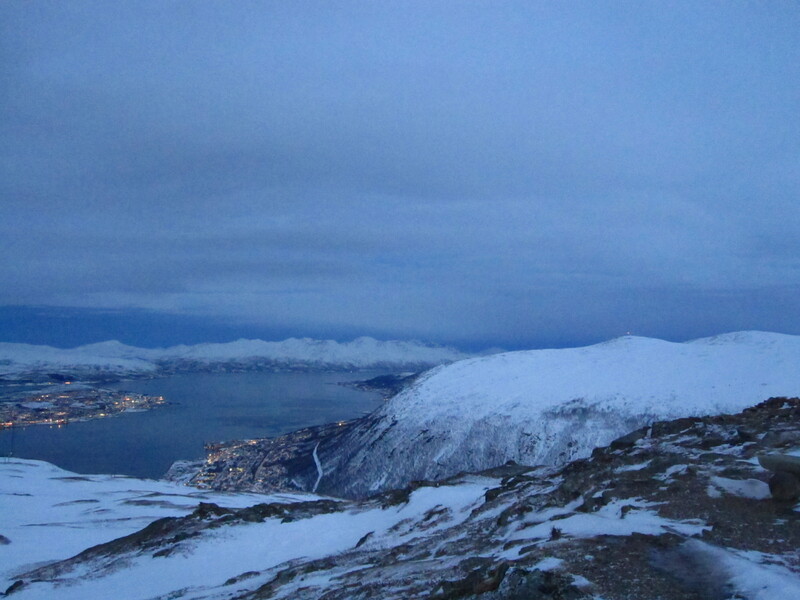 Friday we took the cable car in Tromso up to Stor­stei­nen (Big Rock) on mount Fløya, which is 421 meters above sea level. Steve’s friend, who is from Tromso, came with us. The view from up here is amazing, you look right out to the city, the water, and these snow covered mountains! I thought that view was spectacular, but Ole, Steve’s friend, said there’s a cabin at the top and it’s just a short half hour or so hike up. We agreed to it and it definitely was a bit of work. I can give you advice from experience, never go on a hike in skinning jeans and Ugg boots. It just doesn’t work. 😉 We made it to the “cabin” it was a little wooden building with a table inside and lots of snow. It wasn’t actually too cold out so we had a snack on the picnic table outside looking out to an even more amazing view. After the hike down and back down the cable car, we stopped to get hot chocolate and then it was time to go to the airport to fly back to Oslo. Unfortunately, the flight was 2 hours delayed which sucked because I had hoped I would have had time to start packing that night when I got back, but didn’t get back to my room until after midnight.